Well, the summer’s end is near. Boys and girls everywhere are preparing for the beginning of the academic year, with their backpacks, notepads and loads of energy. It’s also a wonderful time to take your child in for an eye exam. Proper vision is necessary for optimal academic performance. As children grow, some of their many developmental stages can sometimes lead to changes in their vision. An eye exam helps to pick up such changes. Most progress at school is accomplished visually. Yet interestingly, in spite of this overt link between sight and learning, a lot of parents seem to be unaware of this, and don’t get their child’s eyes examined often enough. It’s important to know that because vision in kids changes, regular eye care is central to academic success and overall happiness and wellbeing. As children go through school, it becomes extra important to keep an eye on their vision. Struggling to meet the visual demands of schoolwork may potentially change his/her performance. Technology that’s recently been integrated into the classroom, like interactive whiteboards, can also potentially exacerbate previously unknown vision issues. If a child doesn’t have good enough vision, it isn’t just their school work that is affected. It’s mentally and emotionally taxing too. If you’re the parent of a glasses-wearing child, now is also a good opportunity to consider getting some newer frames. 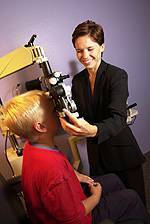 Sometimes, although a child can see clearly wearing his or her current pair of glasses, they may be uncomfortable to wear or perhaps the optical centers of the lenses no longer align with the child’s eyes due to normal development. If you want the kid to wear his glasses, he better like them! So visit us when you’re gearing up for the new academic year. We’ll do our very best to help your child start the year afresh with vision that’s in excellent condition.